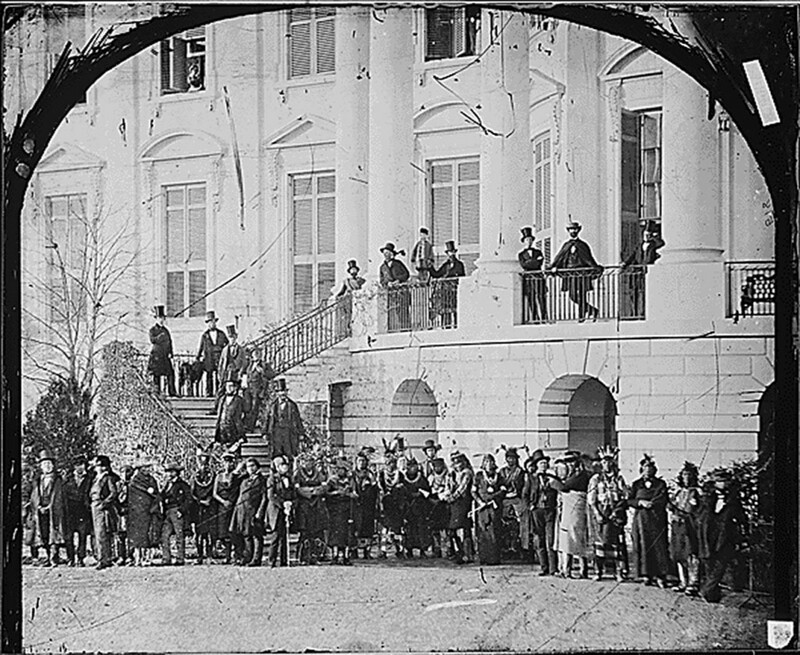 Hearing and understanding American Indian history from an Indian perspective provides an important point of view to the discussion of history and cultures in the Americas. The Indian perspective expands the social, political, and economic dialogue. SL.4.3: Identify the reasons and evidence a speaker provides to support particular points. RI.5.6: Analyze multiple accounts of the same event or topic, noting important similarities and differences in the point of view they represent. How does your point of view differ from the people around you? Do you all value the same things? Do you think Lewis and Clark saw events in the same way the various Native American tribes did? Do you think each Native American group saw events in the same way as the other groups? The student will learn to examine point of view and motivation critically in order to more accurately assess the relative value of the primary sources they will use in the future. If a tape recorder, tablet, cell phone, or other recording device is used, provide basic instructions for operation (teacher provided). A classroom computer and projector. The National Park Service Tribal Legacy website (specific web pages indicated in the lesson). Explain to the students that you will be using secondary sources for examples of the Lewis and Clark expedition today. Show the explanation of an encounter between Lewis and Clark and the Blackfeet written by the National Park Service and the map. Explain that because this record was not created at the time of the event on July 26, 1806, and because it is not a record created by Lewis and Clark themselves, it is a secondary source. It is still a reliable source, because the information was taken from original journal entries and letters, however it has been paraphrased by someone who was employed by the National Park Service, so includes some interpretation. The photograph of the area of the encounter was taken much later (they did not have photography in 1806) and the location was figured out by reading the Lewis and Clark journals, therefore it is also a secondary source. Show the explanation of the Blackfeet episode given by Craig Falcon, a tribal citizen (Falcon) at on the projector or whiteboard, with sound. Explain that this is also a secondary source because Mr. Falcon was not there at the time and the story has been passed down from person to person. Compare the two versions of the story and examine with the class the possible reasons for each group seeing the same event in very different ways. Hand out the following story and questions to the students. Discuss the two different points of view and how each side might remember what happened differently. Divide the class in half. Ask one half of the class to write a paragraph telling the story from the point of view of the Plant People. They might do this individually or collaborate as a group. Ask the other half of the class to write a paragraph telling the story from the point of view of the Travelers. Each student should be able to give one reason why they came to a particular conclusion, either in writing (in their paragraph) or informally in a class question/answer session. Explain to the students that they have just written a secondary source because it contains their own opinion and point of view. Compare the student work with the conflicting Blackfeet stories earlier in the lesson. Explain that secondary sources are always produced from someone’s particular point of view. 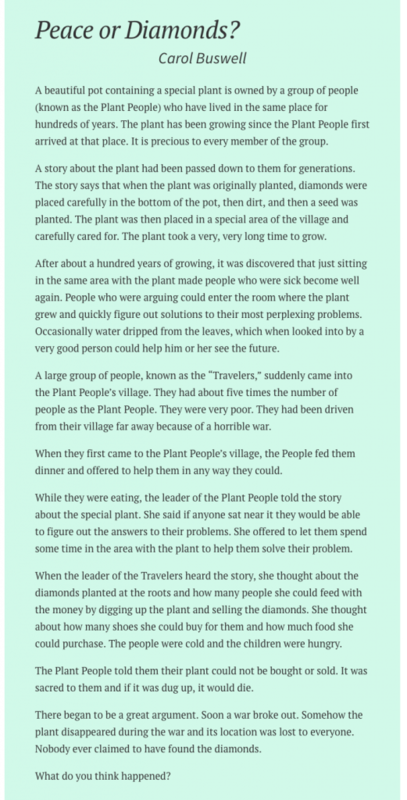 You might assist emerging learners to visualize the problem by illustrating the story using drawings of a plant with diamonds in the roots, posting photographs of poor people or refugees from wartorn countries, etc. An alternative courtroom lesson is provided in the Appendix for advanced learners or older students. Observe understanding of critical concepts by having students practice their presentations in each smaller group before the final presentation. Another possible formative assessment would be using a kinesthetic “debate circle” to examine different points of view. See http://wvde.state.wv.us/teach21/KinestheticAssessments.html.